Nestled among the steep hills of Italy’s Colli Euganei, Vignalta produces award-winning sparkling, white, red and sweet wines. The largest producer in the region, Vignalta started out small, a passion project of Lucio Gomiero, a shrewd businessman who saw the potential hidden below the surface. Inspired by his love of Bordeaux wines, Gomiero started his winemaking adventure as a pastime. Discovering a knack for farming, his journey took him to two continents, growing winegrapes while earning the unofficial title, “king of radicchio”. Gomiero recently shared his story and wines over lunch with the LA Wine Writers at Cafe del Rey. Vignalta means “high vines”, which aptly captures the essence of Gomiero’s wine grapes. Grown at up to 2000 feet above sea level, the high elevation brings something special to the grapes, in addition to sun exposure. These Euganean Hills, southwest of Venice, harbor volcanic and limestone soils in its geology. Over 30 million years ago, a volcanic eruption thrust the Adriatic Sea floor up, and forged these cone-shaped hills into the middle of the flat Venetian plain. Colli Euganei was little known until recently, a rural, verdant mountain microcosm, sometimes called the Regional Park of Veneto, that is home to lots of outdoor enthusiasts. Yet it’s dotted with castles, churches, and villas, and home to distinctive food and wine, with an almost 200-year-old tradition of Bordeaux wine grape varietals. It’s here that Lucio Gomiero’s wine story begins. Gomiero doesn’t do anything halfway. He dives deep into what interests him, tackling three careers so far in his life: architect, radicchio farmer, and accidental winemaker. Gomiero recalled, “I was passionate about wine, and I planted 8 acres of vines just for fun, as a hobby, and when the vineyard came in full production, in 1986, it produced a lot more wine than I could drink, so I started bottling and selling the wine.” But then a friend, who was a radicchio farmer in Italy, told Gomiero that there was a large, untapped market for the plant in the United States. With opportunity knocking, and bag of seeds in hand, Gomiero traveled to Salinas to farm radicchio. Within a few years, he became the largest radicchio grower in the world, supplying not only the US, but Canada and Japan as well. But Gomiero hadn’t given up on his dream of winemaking, for eight years, he continued to commute every month between the winery and the farm, accumulating more vineyards and knowledge along the way. Selling the radicchio business a couple of years ago, he is now focused on the wines, producing 20,000 cases a year. Today, Vignalta has approximately 120 acres of mostly Bordeaux varietals, strewn among many of the Euganean hillsides. And why Bordeaux grapes in a country famous for over 2000 native varietals? Back in the 1800’s, phylloxera wiped out all the existing vineyards, giving wine growers a blank slate. When the locals consulted enology experts, Merlot and Cabernet were recommended as the best choices for consistently excellent wine, based on a previously successful experiment in the area. Gomiero found these Euganean hills perfect for the type of wine he wanted to make. Gomiero noted, “I planted a small vineyard at the beginning and then expanded the operation, and I had the luxury of choosing the best plot for each varietal, and so like no other winery in Italy, Vignalta is scattered all over. In the Colli Euganei, we have vineyards on every hill, choosing the perfect spot for that varietal, with the elevation and exposure, the soil, that’s what really made Vignalta, as a winery, different from any other.” Gomiero is self-taught, he is the winemaker, with no enologist or consultant, but does have a cellar master who knows exactly what to do. He added, “I make the wine, he runs the day-to-day operations when I’m not there.” Living in San Diego, he works to get out the word about how special these wines have become. His flagship wine, Gemola, has been crowned with Gambero Rosso’s Tre Bicchieri 10 times, the award for exceptional wine. Over a fabulous lunch, created by Chef David Vilchez of Cafe del Rey, we explored Vignalta’s many different wines. Starting with an aperitif, the Brut Nature is unique, and very distinctive. Made with 2/3 Friularo, the indigenous red grape of the region, and 1/3 Chardonnay, in the traditional sparkling method of bottle fermentation, there is no dosage, or added sugar, to the wine. Gomiero remarked, “Because the grape itself doesn’t produce much sugar, and is very acidic, I came out with the idea of producing sparkling wine, and to the best of my knowledge, I am the only one producing a champenoise style wine with this grape.” And considering that by itself, Friularo “makes a very tart, unpleasant red wine, the acidity is so high it makes the wine undrinkable”, it’s high acidity makes it a perfect candidate for sparkling. It is mouthwatering, with lots of intrigue, a yeasty note from three years on the lees, and toasty almond highlights float on a slightly aged profile, making this a crowd pleaser! First course, another sparkling wine was poured, the 2015 Fior d’Arancio, an ancient indigenous grape that makes up the region’s only DOCG wines. Otherwise known as Orange Moscato, it’s fragrant with apricot, citrus, and tropical fruit. Gomiero explained, “Traditionally, we make a light sparkling wine, this is only 6% alcohol, and yes it’s sweet but it’s not cloying.” It’s perfect for weddings, pairs well with cakes, and makes great cocktails. Chef David created a Blue Cheese Polenta, using blue cheese that had been washed with orange muscat, and accompanied by a bit of Balsamic Onions on the side. Holy smokes, this was an inspired pairing, really fabulous, kind of in the vein of Sauternes and blue cheese, but another notch up, with the freshness of the balsamic onions. Second course, the only still white wine tasted, the 2015 Pinot Bianco, is both floral and earthy, and textured from several months of resting on the lees. It’s mineral backbone expresses itself as a saltiness, seeing no fining and no oak, it’s all stainless steel that captures the essence of the chalky limestone soils that once were at the bottom of the ocean. This minerality allows the wine to age well. Chef David paired a Grilled Celery Root and Lentil Salad over Spinach, dressed with a Shallot and Chive Vinaigrette, with it, and that smokiness resonated with the mineral character of the Pinot Bianco. Third course, the 2010 Rosso Riserva, a blend of 60% Merlot and 40% Cabernet Sauvignon, represents the work horse of Vignalta. Gomiero observed, “Rosso Riserva is the wine I produce the most of, about 80-90,000 bottles a year.” Consistently good, Gomiero attributed its quality to the hillside vineyards, where Merlot makes superior wines. The Rosso, a blend of 8-9 vineyards, is aged in two-year-old barrels. He said, “To me, Merlot plays very well with food, it’s balanced, with good acidity, and especially good with tuna, which, of all fishes, has the most beefy quality.” Chef David hit it out of the park again, serving a Seared Tuna with a Pomegranate Reduction, Olive Oil, and Herbs, increasing the Rosso Riserva’s aromas and going well with it’s softer tannins. 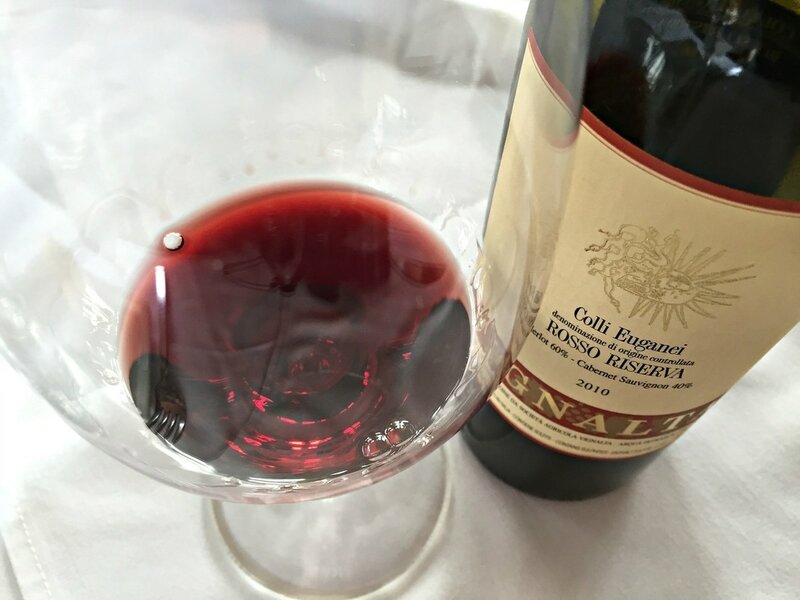 Fourth course, the star of Vignalta, Gemola, Italian for “Little Jewel”, a blend of 70% Merlot and 30% Cabernet Franc, exhibited more structure and the wow factor. Gomiero clarified the difference, “The soil in the Gemola Hills is made of decomposed lava rock, it crumbles very easy, you squeeze with your hand, and it turns into loose sand. Very rich in minerals, very poor in organic matter, it naturally makes the vineyard low yield, but very concentrated grapes with a distinct character.” The Merlot is from a single vineyard, Gemola, and is the only wine Gomiero makes that is aged in new French oak barrels. Gemola is recognized world-wide for its excellence, earning awards throughout Europe. Chef David paired Calamari with Prosciutto di Parma, Olives, Capers, Chili Flakes, and Tomato with the 2011 Gemola, Vignalta’s most recent release. For Gomiero, Gemola best illustrates how beautifully Merlot grows in the Colli Euganei, and it certainly was a stunning and intriguing wine. Fifth course, it’s dessert time! The Alpianae, a passito style wine made from the Fior d’Arancio grape, was a challenge for Gomiero to make. The grapes, once picked, are placed on trays inside the winery, and allowed to slowly dry over four months. Then the grapes are crushed, but you only get a small amount of very thick juice, and then begins a slow fermentation that takes about a year and a half to complete, yielding a wine that is from 9-13.5% alcohol. Gomiero said, “Nobody was making this wine before, so it’s my baby, and I had to learn how to perfect the winemaking, and I have to say it took maybe a dozen years to figure out how to master the fermentation.” All that hard work was worth it, since it’s deep gold color affirms the apricot and candied orange peel nose, balanced with acidity, it commands you to take one sip after another. Gomiero boasted, “It’s a wine that, a couple of years ago, in the Decanter World Wine Awards, Alpianae came first, best Moscato in the world!” Chef David served a Pumpkin Biscotti, dipped in Chocolate and Macademia Nuts, with Macerated Berries, Chantilly Cream, and Raspberry Coulis alongside. Gomiero is proud of all of Vignalta’s wines, “People sometimes ask me if there is any wood in the wine, it’s all stainless steel fermentation, the volcanic soil produces an almost salty wine, a lot going on in your palate, that is due to the richness of minerals. I don’t do any fining to any of my wine, it’s grapes and nothing else.” And to prove that it’s the soil that imparts that smoky character to the wines, Gomiero poured a Pinot Nero 2014, which is so fabulous, the sense memory still haunts me. A smoky minerality from limestone soils permeates the glass, it’s an extremely small production, even the grapes are foot-stomped by Gomiero’s grandchildren. 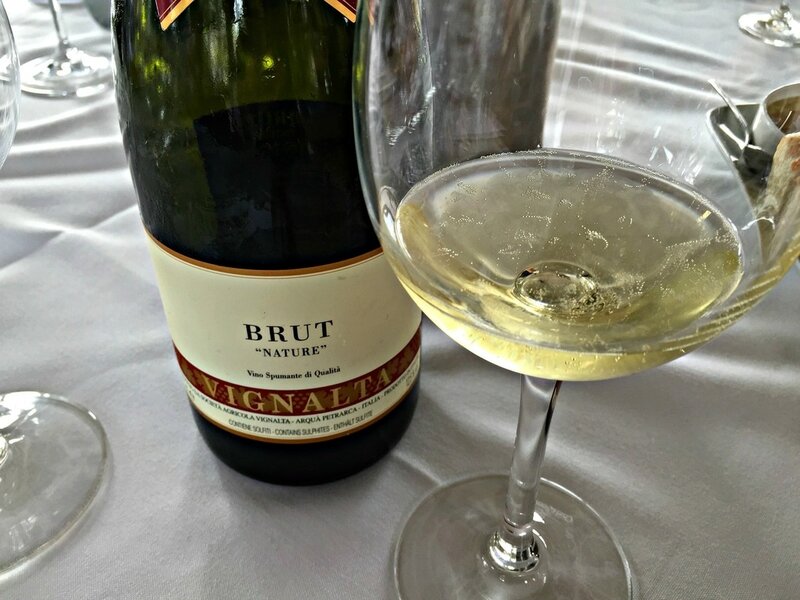 Elegant, delicious wines at a reasonable price, Vignalta is a pick for any occasion, with a wide array of styles and varietals. Gomiero is set to place another jewel in his crown of achievements, that of a masterful winemaker, the king of the Colli Euganei, bottling his passion while capturing the world's palate, one bottle at a time.